There is a difference between the phone and the communication service we have always associated with the handset. The presumption of a wired phone in every home has changed dramatically in recent years with certain groups of people who would not consider installing a phone in their new home or apartment. The premise behind OurOldNumber.com revolves around the basic question: Is the value of the traditional phone contained in the handset or the number associated with the occupants of the residence? As the younger generation is demonstrating, it's the association of the number to your identity and reachability wherever you are, not the location of a landline handset. OurOldNumber.com is a SaaS-based telephone alternative utilizing the cloud and the ubiquitous mobile phone to provide the security of a home/family phone number without the cost and equipment associated with a landline. OurOldNumber.com provides customers with the ability to keep the landline telephone number they have had for years while reducing their expenses and gaining a number of features. The customer will still receive calls made to the old landline telephone number. Callers will hear a recording in the customers own words and voice. It will direct the caller to choose from an extension number to reach the person they were calling. 1. Keep your “old number”. 2. Lower monthly costs ($10-16 per month). 3. 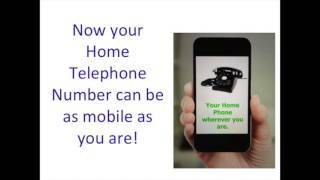 Effectively block unwanted “robo” calls and telemarketers. 4. Allows routing incoming calls to the correct party; no more taking messages for family members. 5. Receive voice mails via email. 6. Turn off calls if and when they wish. 7. Control routing/features from desktop or mobile device. 8. Cancel local service and reduce costs. Senior Operations, Sales and Marketing Executive successful at building and managing operations with P&L responsibility up to $400 million. Expert at capitalizing upon market opportunities to drive revenue growth by introducing leadership focus, technology and process redesign, performance measurement and management team accountability.